In current times, the ‘nautical’ star is a symbolic star that originally becomes known for its association with the United States armed forces/navy/marines, as well as having been incorporated in various manners over time, for e.g. the star symbol on a compass may have been distantly related to the ancestral nautical star, which dates back centuries through civilizations. Apart from having its naval symbol, the nautical star is one of the most popular styles of star design in the tattoo culture. The star is representative of several meanings and beliefs, especially when paired and inked on particular and specific parts of the body, giving it entirely special significance. An example of this can be seen wherein that when the star is inked on the left wrist and aligned with the thumb, it is believed that the tattoo represents some sort of positive guiding power for the future of the one who wears it. This makes sense if you’re into superstition, as the left palm is used in fortune telling by reading one’s hand palm, rendering the star a symbol of guidance to the palm. 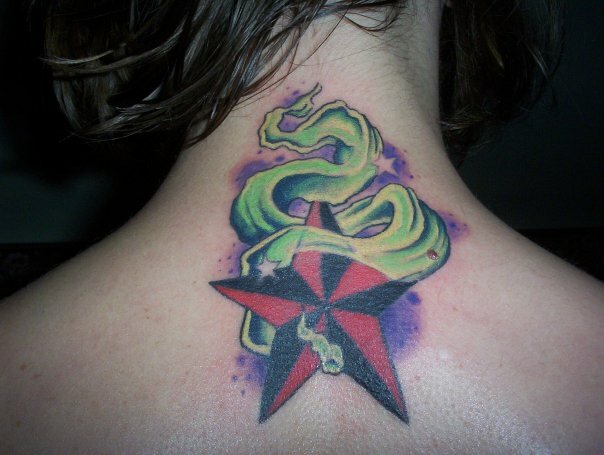 However, it is often the case that the real significance of the symbol of the star itself may not be of much value to most people who get tattoos, they may not even be aware of the story behind the nautical star to begin with. The star is widely appreciated in the world of tattoo art for its design alone as well – the beauty, simplicity, symmetry and simply for it’s ornamental and decorative value. The symbol of the nautical star tattoo is a design that compliments both men and women very well, adaptable and alterable to suit just about any kind of tattoo design. We will be looking at the use of the nautical star in various tattoo designs that give the original star new and modern meaning. Applying the element and value of the star in to modern design gives the art of tattooing a vibrant and contemporary look, especially when experimented against the backdrop of bright colors and vivid design elements. While the original nautical star will always hold true to its charm and value, trying out a fusion of different palettes and designs that compliment the star (or vice versa) can make for a very cool and funky looking tattoo. Have a look at a few example of nautical star tattoo designs below. If you really love tattoos, there are more posts which you must visit, 29 Gorgeous Wrist Tattoos, 33 Stunning Behind The Ear Tattoos and 26 Dazzling Tattoo Fonts. Thanks to share star tattoo pictures……. I’ve always been a big fan of tattoos, I adore the idea of making my body a temple of memories.